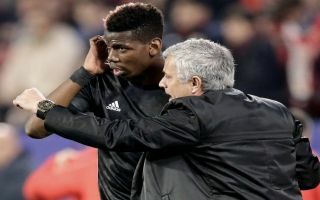 Manchester United boss Jose Mourinho has put an end to the speculation over a rift between him and Paul Pogba, insisting he ‘couldn’t be happier’ with the Frenchman. The Red Devil’s kicked off their latest Premier League campaign last Friday against Leicester City and ran out 2-1 winners thanks to goals from Luke Shaw and stand-in captain Paul Pogba. The France international bossed the game in the middle of the park despite only just returning from an extended break following his World Cup winning exploits in Russia over the summer. The 25-year-old has had little time to prepare for the new season, but at Old Trafford last week it looked as though he had successfully transferred his form from the biggest possible stage to club level seamlessly. Pogba has always been a supremely talented footballer with all the attributes of a great midfielder, but his second spell at United has been largely dogged by inconsistency to date. According to The Evening Standard, the enigmatic playmaker hasn’t seen eye to eye with Mourinho since his return and Barcelona have been monitoring his situation with great interest. However, The ES also reports that the Portuguese boss has tried to put pay to any rumours of bad blood between him and Pogba in a press conference today, stating that the French star is ‘working well’. “The truth is we are together for two years and a couple of weeks, and I’ve never been so happy with him as I am now,” Mourinho told reporters – as per The ES. “He’s working well, he’s playing well, he does for the fans, he does for the team and that’s what I want. The United bosses comments will surely now go some way towards ending speculation linking Pogba with a move away from the club and supporters will hope that the midfielder can reproduce his best form on Sunday for the team’s first away game of the 2018-19 season against Brighton.